One of the best choices I ever made was starting a blog. Not only did it open my thoughts and words up to the world, but the world seems to have opened up to me as well. I’ve met so many great people who have had a major influence on my life since I launched my blog. I’ve also had a positive influence on many others myself. I launched my blog in 2012. It’s amazing how things have changed since then. I remember learning about FTP, web hosting, and the difference between a self-hosted blog and a hosted blog, and then I learned about WordPress, which is one of the best creations since sliced bread! Setting up my blog took me many hours and many days, and many frustrations! Setting up a blog today is much easier. Instead of a huge learning curve and hours to set up (or days in my case), it takes just a few minutes. And having a blog today is one of the most effective ways to share your message with the world, to create a platform, and add value to others including your family. On a weekly basis, people ask me questions about my blog or my blogging experience. My first recommendation is always to set up a self-hosted blog on WordPress. The good news, as I mentioned earlier, it won’t take hours or days. It’ll only take a few minutes. In fact, it’ll take 10 minutes or less. I delayed starting a blog due to the learning curve, and a little bit of fear. You don’t have to do the same. And you shouldn’t do the same. It’s too easy and there is so much opportunity when you have a blog. 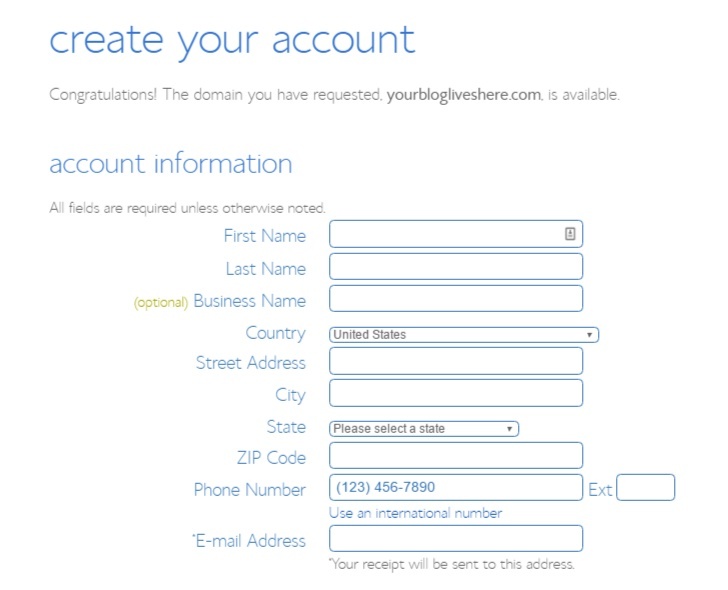 Follow the steps below and in about 10 minutes, your blog will be ready for the world! Your hosting account is where your blog will “live.” Hosting is important yet very inexpensive. It’s basically a server in the cloud (“the cloud” = a remote computer), where you will rent “cloud” space to install the WordPress software and manage your blog. It might sound complicated, but it’s not. So, let’s keep going. Note: I am a Bluehost affiliate, which means they pay me a commission every time someone signs up via one of my links. It doesn’t increase your price at all. In fact, your price will reduce as Bluehost offers special discounts to referrals from its affiliate partners. 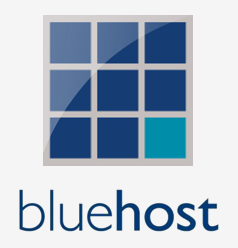 Below are several reasons I recommended Bluehost. Easy to use. Quickly get started with Bluehost’s one-click WordPress install. It is super simple! WordPress recommends them. WordPress (aka sliced bread) only officially recommends three hosting services. Bluehost is number one. They host close to one million WordPress blogs. No limits. You literally have no limits – unlimited websites, email accounts, and domains – all on one account at an affordable price. Very affordable. Bluehost is super inexpensive. You will spend as low as $3.95 a month, depending on which plan you select. The longer you are willing to commit, the cheaper it is. Money back guarantee. No funny business, no contracts. 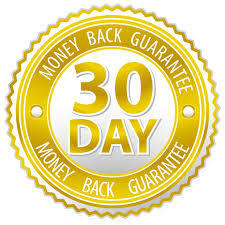 They have a solid 30-day money back guarantee and the option to cancel at any time. Reliable. Bluehost has custom-built servers which provide the most stable and reliable hosting environment. Next, you need to choose a domain name for your site. My domain name is “JackieBledsoe.com.” If you already own a domain name, you can enter it here under “i have a domain,” and you will just have to go through a few extra steps to make sure you get your DNS pointed to Bluehost. Click here to jump to the step at the bottom of this page for pointing your DNS to Bluehost. If you don’t already have a domain name, you can purchase one from right in the sign-up process. This domain will be included free with your new WordPress hosting account purchase. Once you’ve entered a domain name, fill in your personal information. 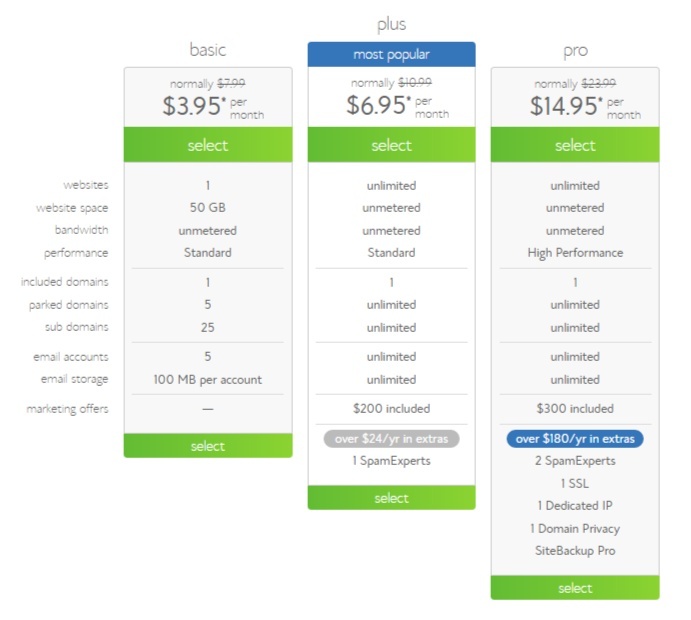 Then, choose which hosting package you want. 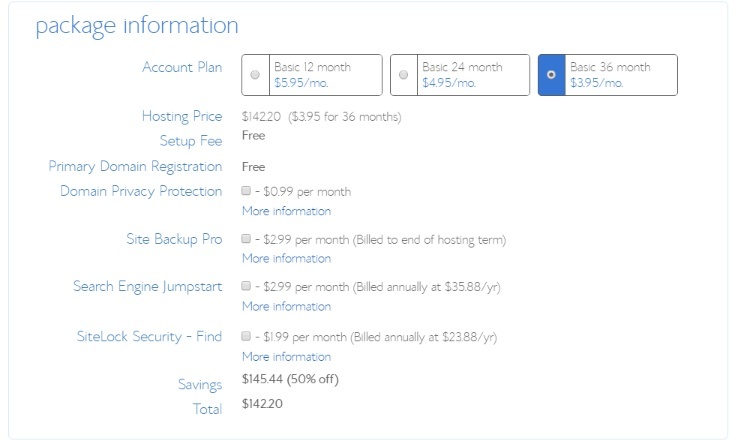 Shared hosting is priced at 12, 24 and 36-month terms. If you’d like to save money, purchase a longer term, which lowers your monthly rate. For example, by choosing a 36-month hosting term, you can get the great introductory rate of $3.95/month for a Basic account. 36 months at $3.95 per month is $47.40 per year and $142.20 upfront. It’s not necessary to sign up for any of the other services listed on this screen, but it’s up to you. Now you’ll need to enter your billing information. Confirm that you have read and agree with Bluehost’s Terms of Service, and then click on the Next button. 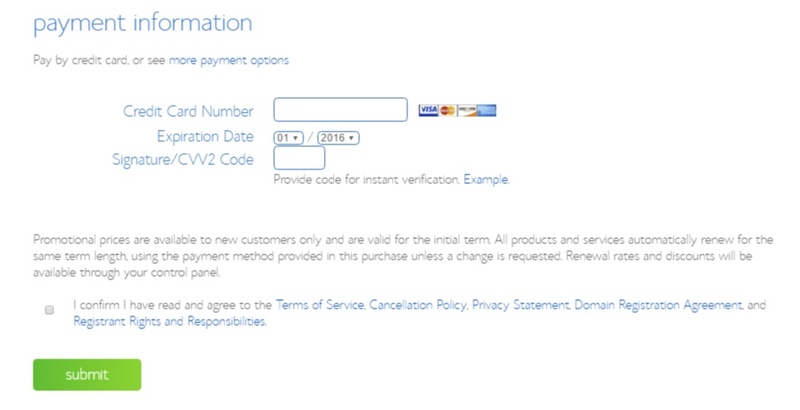 The system will now verify your credit card information. Bluehost will next ask you to “Select the Upgrades that Best Suit Your Needs.” My suggestion is to skip all of these. Just click “Complete” at the bottom of the page. It may take a minute or more, so be patient. Now you should see the “Welcome to Bluehost” screen, along with a “Congratulations” message. You’ll then be asked to create a password for your account. You can use the Password Generator to create a strong and secure password, or create one yourself. It is required to have both capital and lowercase letters, a number, and a special character (? !#, etc.) in order to have a strong enough password to protect your account. Warning: You may get an error message here. Sometimes takes a few minutes for Bluehost’s system to create your account. No worries. If necessary you can call, call BlueHost Support at 1–888–401–4678. Don’t be intimidated by this step—you are fully capable of doing it. When I set up my blog it was way more complicated, and I had to do some serious study and trial and error to do it. But with Bluehost it’s super-simple. You can do it! Scroll down the page to the “Website” section. Click on the Install WordPress logo and wait for the new page to load. It might take a minute. A new “WordPress” screen appears. Now click on the Install button,which will bring you to a new screen. Select the domain on which you want to install WordPress. It should default to the correct one. Click on Check Domain. The next screen will say “Last step, you are almost there.” Click on “Advanced Options.” Type in your site name or title. (You can always change this later if you want to.) Accept the “Admin Username” and “Admin Password” that Bluehost suggests. Now click on the item that says, “I have read the terms and conditions of the GPLv2.” Now click on the Install Now button. The installation process should begin and will keep you updated on the process. This may also take a minute or two. Bluehost might then offer you another upsell. (Reminds you of “would you like fries with that?” doesn’t it?) Just close the pop-up if there is one. Look for the X in the upper right-hand corner of the pop-up to close it. Click on the View Credentials button, which takes you to the Notification Center. Click on the View button. Once this is finished you’ll be taken to a screen with your Blog URL, Login URL, username, and password. You will also receive an email from Bluehost with this information, but I suggest writing it down as a backup. You can also take a screenshot or clip it to Evernote. You’ll need your password in the next step, so copy it to your clipboard so you can easily paste. Click on the “Admin URL” link. 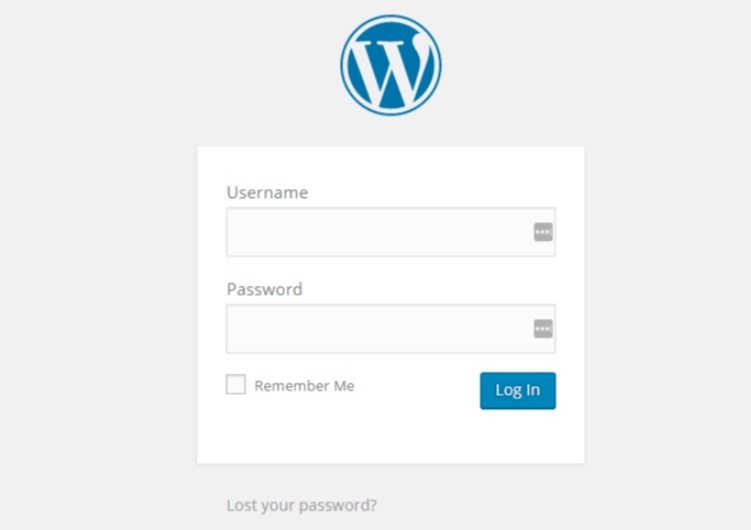 This will take you to the WordPress login page. Now enter your username and password. (Remember, you wrote these down in Step 2. You also copied the password to the clipboard.) Click on the “Remember Me” checkbox and then click on the Log In button. 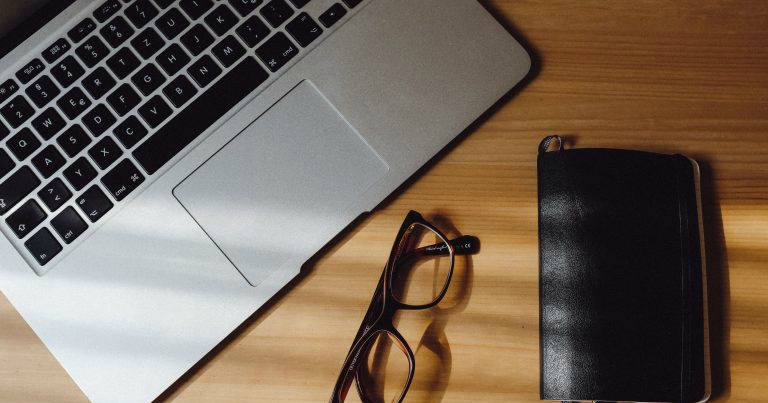 You should now be looking at the WordPress “Dashboard.” Sometimes, bloggers refer to this as the WordPress “back-end.” The front-end is what your readers see—your normal blog site. The back-end is what you see—how you control what appears on the front-end. You might see a welcome screen or an offer for JetPack like the one above. Don’t worry about these now. Click on the Posts | Add New option in the left-hand side menu. You should now see the New Post screen. Now click the Publish button. This literally publishes your post for the world to see. You might see a message that says, “Your site is currently displaying a ‘Coming Soon’ page. Once you are ready to launch your site click here.” If so, click on the “click here” link. To view your post click on the “View Post” link. Your new blog should load in a new browser tab. As you can see, there’s nothing very fancy here. WordPress uses a very generic theme by default. But that’s the beauty of WordPress. There are thousands of themes available. I use the Get Noticed! Theme for my site, but I started with a free theme before upgrading to a premium theme, and then to Get Noticed!. What if you have already registered your domain name on another service? No worries at all. The first thing you will need to do is to point your domain name to the Bluehost servers. This varies depending on where you registered it. Below is the process. Note: If you don’t already own a domain, then this Step #5 is not needed. You can just skip to the bottom, or click here to get your Bluehost discount. Now click the arrow icon next to the domain name in question to display an options menu. 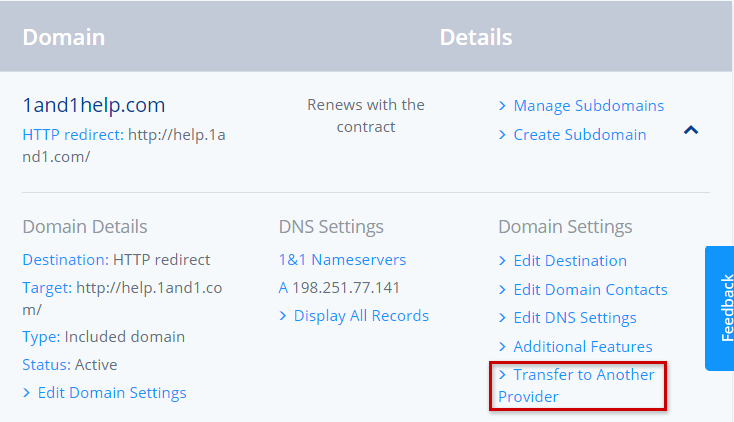 Next select Transfer to Another Provider from the Domain Settings section of the options menu. Click the Disabled link. 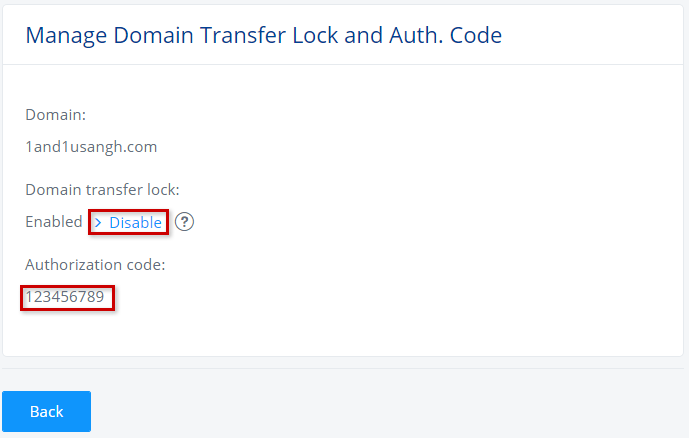 Take note of the Authorization code for the domain. The authorization code is needed when initiating the transfer request with the Gaining Registrar as verification that you are the current holder of the domain. Some domains do not have Authorization Codes assigned to them. For these domains, the Authorization Code will not appear at the bottom of the list on the Info page. That’s it. It can take 24–48 hours for these changes to take effect. You might get lucky, and the changes will take effect in an hour or two. Once you have done this, you can begin the process of setting up your WordPress blog. 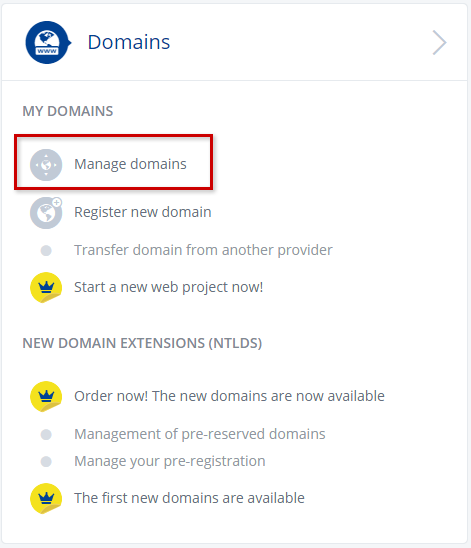 In Step #1, after you click “get started now,” you will need to enter your domain name in the right-most box that says, “I Have a Domain Name.” Click here to go back to Step #1 above. Please note: Bluehost, 1and1.com, or your Registrar (the company from whom you bought your domain) may change their procedures from time to time. If you have any problems, please check with them. I do not provide technical support for this process. In case your current host requires the Bluehost nameservers I’ve shared them below. However, I have other sites on Bluehost, including my wife’s site and our daughter’s site which I helped them set up. I guess I am kind of like the mechanic who works on his own car last. Bluehost specializes in shared servers and it is the right choice for a vast majority of bloggers. You can get Bluehost web hosting for only $3.49 a month. That’s $4.50 off their regular rate! Click on the button below to take advantage of this offer. If you're not satisfied with Bluehost, they'll give you your money back. No questions asked, no time limits. Cancel at any time, and they'll issue you a refund for the remainder of your current payment term. It's like a warranty that never expires! Plus, during the first 30 days, they'll refund your hosting fees in full. See Bluehost’s full guarantee here.